If you’ve ever considered taking the plunge into the addicting world of track days, but don’t want to go with a one-piece race suit, you’ve probably looked at the aptly named Alpinestars Track Leather Pants as part of a jacket/pant combo. Already a solid pant, Alpinestars has taken them to the next level and is releasing a newly updated and beefed up version, the Track Leather Pants, new for Spring 2015. Just like previous Track Pant from Alpinestars, these pants are built to provide excellent protection for aggressive, high-speed riding. 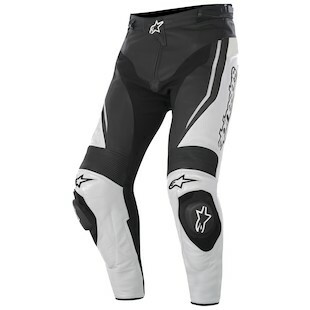 Alpinestars has put in the work to make these pants even more protective than the previous version, by beefing up the entire garment to achieve a CE rating. Additional protectors are present, including CE certified hip, knee, and tibia protectors, compared to the foam hip padding found in the previous model. Comfort is improved as well with additional stretch inserts at the knee and crotch areas to allow for easier movement, and adjustable ankles to provide a perfect fit to a greater range of riders. Lastly, the pants now have perforated leather panels on the front and back of the thighs to provide improved ventilation. The new Track Leather Pants are worth a look for anyone with aspirations of hitting the track this year, or track day veterans looking to get some new gear. Between the improvements to protection, comfort, and the overall look, the new Alpinestars Track Leather pants are sure to be a winner.